2014 Masons of California present $101,000. to the inland Empire public schools and students. Investment in successful scholarship program. "On the corner of Fourth and Utah ["D"] streets, Judge A. D. Boren is putting up a very HANDSOME BUILDING, which fronts 40 feet on Fourth street and has a depth of 60 feet, and will be two stories in height. The building, when completed, will be a decided ornament to that business portion of the town. Meyerstein & Co., the well know [sic] dry goods and grocery dealers, will occupy the corner store on the first floor. The upper story will be made into a city hall---which, by the way, is a thing very much needed in our town." No photograph or substantiating document could be located that verifies that the building was actually completed and that City Hall was located in it. 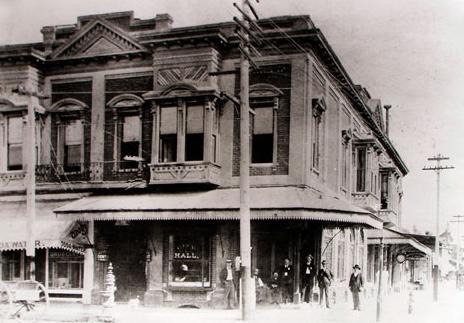 The first permanent location was at the southwest corner of Third and D Streets and opened in 1901. Only the ground story was designated as the City Hall with a dentist office located on the second story. Today, Vanir Tower occupies the location once housing San Bernardino's City Hall. On July 7, 1919 the City Council passed Ordinance No. 727 authorizing the purchase of the Farmers Exchange National Bank building, which was constructed in 1888. "The city purchased of the Farmers Exchange Bank its bank building for $40,000, to be paid for at the rate of $166.67 per month, for twenty years. The city hall, houses all general government officers, street department, police department included, also water department and United States Forest department. The city hall well answers the needs as an administration building, centrally located and convenient to the county offices." 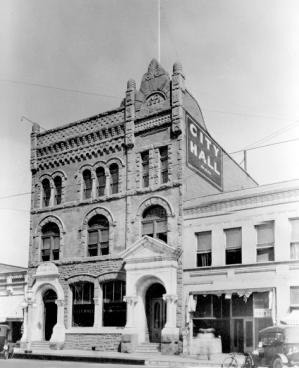 In August, 1919 City Hall personnel moved into the old Farmers Exchange Bank building, located on the west side of D street between Fourth and Fifth streets. On one side of the City Hall was a barber shop and on the other side was a shoe shop. Painted on the side of the building beneath the words, CITY HALL, is the date, Aug. 30, 1919. 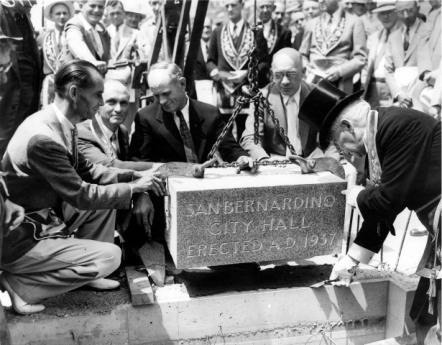 San Bernardino's Mayor C. T. Johnson had the honor of turning the first shovel of earth back on March 6, 1937 when ground was broken for a new City Hall to be located at 426 Third Street. The building was built as part of the Public Works Administration projects. San Bernardino Freemasons Laying the cornerstone. Left to right: Mitchum Dewitt, Architect; unknown; Ora Miller; Mayor C.T. Johnson; unknown. 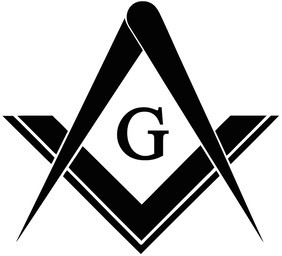 The two "unknown" gentlemen look like Masons. "RES. 60 DAY EXTENSION NEW CITY HALL Final. 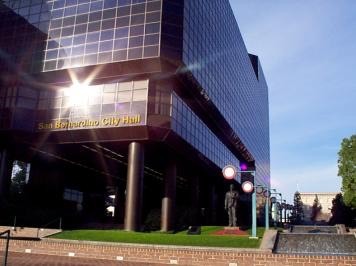 A Resolution of the mayor and Common Council of the City of San Bernardino, requesting a time extension in which to complete the City Hall, from the Public Works administration, was read for final passage and adopted by the following vote, to-wit: Ayes: Councilmen Herkelrath, Atwood, Shafer, Holcomb, Sheehan. Noes: None. Absent: None." 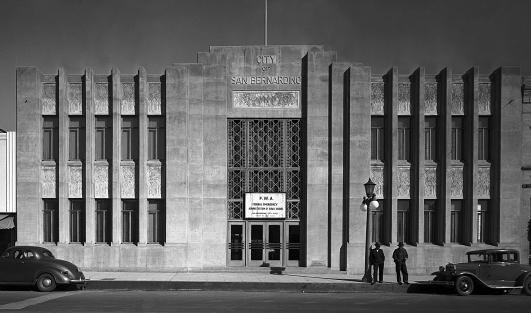 Finally, on February 28, 1938, the City Council formally accepted the building and City Hall employees then began the move into their new facility. In 1969, City Hall moved temporarily to the old American National Bank building on the northeast corner of 3rd and E Streets. The Public Works Administration City Hall building was demolished to clear ground for the construction of the City's current City Hall. Planning of the overall project began in 1963 under the guidance of a citizen's committee. The design contracts for the City Hall, exhibition hall, and parking structure were completed by September 1972. ¨ 6,000 tinted smoke glass windows, avoids visibility from outside. The City Hall is a six story, glass-sheathed building - sculpture designed to engender civic pride and reflect the urban environment around it. Internally, with the exception of the council chambers, it is a functional office building; all walls are removable for change. In 1982 the American Institute of Architects celebrated the 50thAnniversary of the Historic American Buildings Survey under the sponsorship of the United States Conference of Mayors and the United States Department of the Interior. Selected were 30 of America's City Halls which presented civic architecture that revealed the changing architectural tastes and social orientations of America. 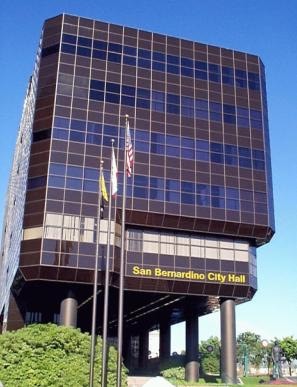 San Bernardino City Hall was selected as a modern super high tech example of the 20th Century.